Juan Soto is now the youngest player in the majors. The Washington Nationals had a rough Saturday. 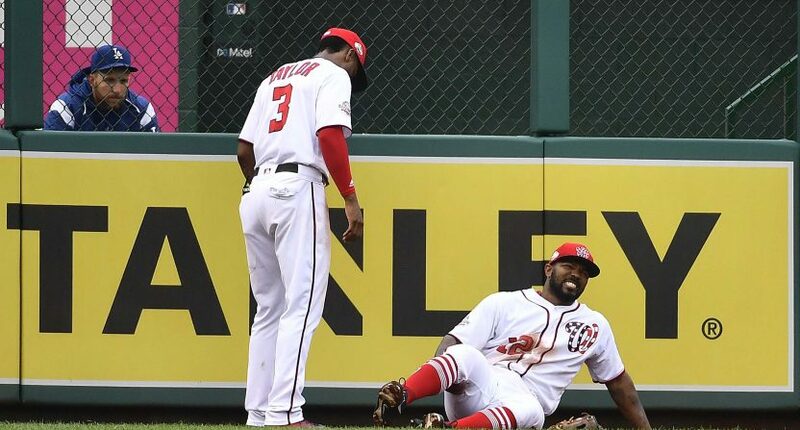 Washington lost both games of their home doubleheader against the Los Angeles Dodgers (and blew Game 2 in the ninth), and they lost veteran Howie Kendrick for the season to a ruptured Achilles suffered in Game 1. Kendrick, 34, had a .301/.331/.474 slash line on the season, while offering defensive versatility that saw him start 32 games at second base and four games in left field. While he was no longer the same player as his younger years with the Angels, Kendrick is annually one of the league’s best hitters for average (.291 career AVG; .315 AVG in 2017) and is just a rock-solid veteran bat that will be missed by the Nats. So, that news is no fun for the Nats and their fans. What *is* fun news is that the Nats are calling up one of baseball’s most exciting prospects to take Kendrick’s place on the roster. According to MASN Sports’ Byron Kerr, the Nats are calling up 19-year-old outfielder Juan Soto from Double-A on Sunday. And with that, Soto will become the youngest player in baseball (it had been 20-year-old Ronald Acuna, who made his MLB debut with the Braves a few weeks ago). Juan Soto is 19 years old and will become the first teenager to play for the Nationals since Bryce Harper in 2012. Soto never even played a game in Triple-A, and only played eight games at Double-A! I assume he'll play four games with the #Nationals and then get promoted to some super league nobody else knows about. Juan Soto somehow making Ronald Acuña's incredible rise through the minors last year look downright conservative. Soto — who signed with the Nats out of the Dominican Republic in 2016 — is a left-handed hitting (and throwing) outfielder listed at 6’1″, 185 pounds, and has been tearing up every minor league level he’s (briefly) been at. At three levels this year, Soto has put together a combined .362/.434/.609 slash line with 14 homers, 52 RBI, 29 walks, 28 strikeouts, and three stolen bases. Those are absolutely ridiculous numbers, regardless of the level- especially for a 19-year-old. With Acuna graduating to the majors, some evaluators feel Soto is the second-best prospect in baseball behind only Vladimir Guerrero Jr. The Nats wouldn’t call Soto up to the majors already unless they intended to give him legitimate playing time, so expect to see a lot of him quickly. Washington is currently 24-20 and three games out in the NL East. The Nats remain the favorite to win the division, but are currently dealing with several injuries to key offensive players (Adam Eaton, Daniel Murphy, Howie Kendrick, etc). It probably took these injuries for the Nats to really consider promoting Soto after he’s just played eight games above A-ball, but here we are, and it will be very interesting to see how the 19-year-old performs against big-league pitching.